CONNECTIVITY MATTERS 1 4 | B R O A D B A N D C O M M U N I T I E S | w w w. b r o a d b a n d c o m m u n i t i e s . c o m | J U LY 2 0 1 8 The Case for Fixed Wireless When the economics of fiber to the home don't work, fixed wireless may provide an acceptable alternative – and sometimes serve as a transition to an all-fiber network. By Trevor Jones / OTELCO I f your community is struggling with the economics of a townwide fiber network, you are not alone. e good news is that although wiring your whole town with fiber is the ideal solution, there are other options for getting broadband access to your constituents if you just can't raise the funds – and don't let anyone tell you otherwise. For as long as I have been engaged with community broadband networks, the technologies best suited for public investment have been a source of debate. Some believe public money should be invested only in fiber to the premises because fiber infrastructure investments have sufficient capacity to be future-proof for at least 20 years. On the other hand, building fiber is expensive and time consuming, and a full-on commitment to a fiber-only solution probably means it will be many years before some areas see the kind of investment necessary to bring them improved service. Communities in that situation should explore more cost- effective means of connecting their residents. One platform I see as a very viable choice for this is fixed wireless. It has a lower cost of deployment in less densely populated areas and can meet or exceed the current federal broadband standard. In addition, many components of a fixed wireless deployment have long-term infrastructure value to the community. Although the radios and antennas will need to be replaced in a few years to meet growing demands for bandwidth, electronics for fiber networks also need to be replaced. • Wireless networks push fiber closer to customers. Wireless networks that meet the current FCC broadband standard of 25/3 Mbps use higher-frequency 5 GHz radios that are broadly distributed on poles. Backhaul must be in place for each pole, and to the extent that fiber backhaul is used, the construction of a fixed wireless distribution network can bring fiber connectivity closer to homes, getting people connected now while shortening the path to an all-fiber future. • Vertical assets are long-term investments. Like fiber, the poles and towers used in a fixed wireless deployment have long life spans and can be used for multiple purposes, including emergency radio services and two-way radio systems for municipal government – as well as the next generation of wireless broadband. • The life span of investment in electronic components is more comparable than you think. A primary reason communities choose fiber to the home over other technologies is the belief that the investment in fiber is future-proof – and that is true for the cables themselves. e achievable bandwidth on fiber is virtually limitless, and the cable has a life span of 20 years or more. On the other hand, the electronics used to light the fiber will need to be replaced in a much shorter time frame, either because they lack enough bandwidth to fulfill demand or because of their age. e life span of these electronics is much closer to five years, which is more comparable to that of the radios in a fixed wireless deployment. • Wireless can be an important supplement to fiber. 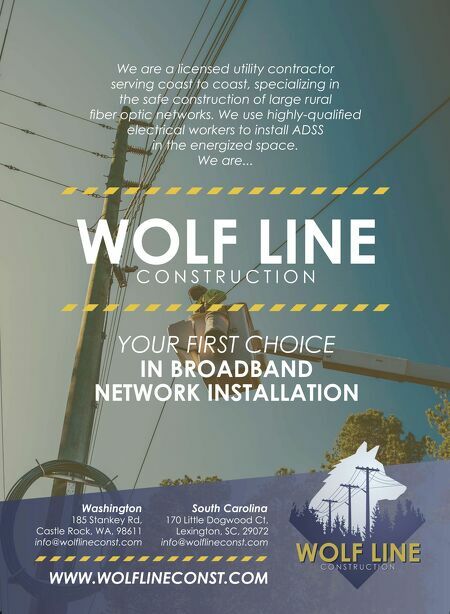 If your town is making an FTTH investment but struggling with a few difficult areas – say, a neighborhood where utilities are direct-buried under new streets or one on the far outskirts of town – fixed wireless can close the gaps so everyone is included in the broadband deployment. Notice something about these examples? 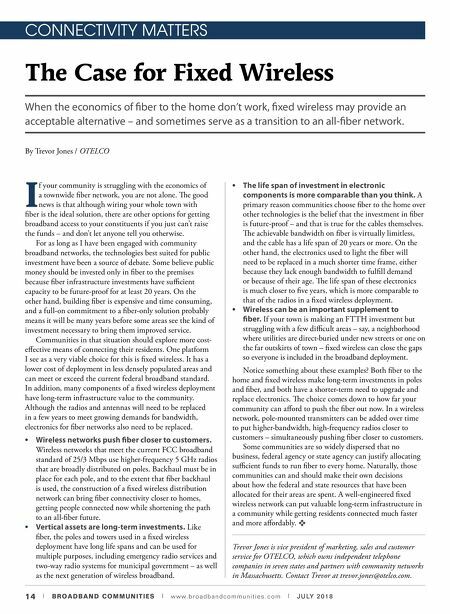 Both fiber to the home and fixed wireless make long-term investments in poles and fiber, and both have a shorter-term need to upgrade and replace electronics. e choice comes down to how far your community can afford to push the fiber out now. In a wireless network, pole-mounted transmitters can be added over time to put higher-bandwidth, high-frequency radios closer to customers – simultaneously pushing fiber closer to customers. Some communities are so widely dispersed that no business, federal agency or state agency can justify allocating sufficient funds to run fiber to every home. Naturally, those communities can and should make their own decisions about how the federal and state resources that have been allocated for their areas are spent. A well-engineered fixed wireless network can put valuable long-term infrastructure in a community while getting residents connected much faster and more affordably. v Trevor Jones is vice president of marketing, sales and customer service for OTELCO, which owns independent telephone companies in seven states and partners with community networks in Massachusetts. Contact Trevor at trevor.jones@otelco.com.